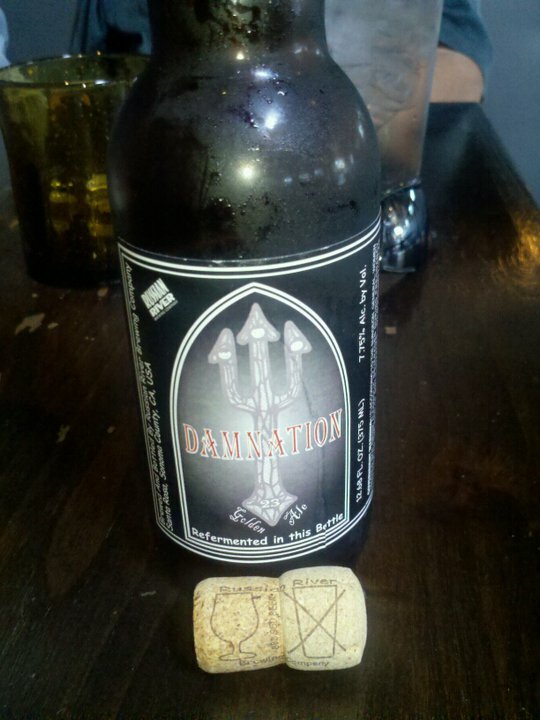 I ordered a bottle of “Damnation” by Russian River Brewing Company. Surprise #1 was that it came with a cork like a bottle of sparkling wine. Upon popping it open (turn the bottle, not the cork), Surprise #2 was that there were instructions for choosing the proper glasswork printed right there on the side of the cork. First time I’ve seen that from any beverage that wasn’t a can or bottle of Guinness Draught. As it turns out, the beer turned out to be a Belgian Style strong golden ale — Surprise #3. As I’m not a fan of this type of beer, this surprise was not quite as amusing as the first two. If only the drinking establishment had grouped it with the other Belgian-style beers, I would have gone with something more like an Boont Amber, Racer 5, or an Alley Cat. As it stands, I learned something new at the expense of $8. Tags: Alley Cat, Anderson Valley, Bear Republic, Boont Amber Ale, Guiness, Lost Coast, Racer 5, Russian River Brewing. Bookmark the permalink. Previous post ← Why only now? !